This parishioner’s personal insight is a core tenant of the Gospels. Each evangelist insists in his own way that the crucifixion was not a calamity that befell Jesus but rather a carefully chosen destiny. The crucifixion was not a calamity that befell Jesus but rather a carefully chosen destiny. Verses 43 and 44 of St. Luke’s 22nd chapter have always been accepted as canonical by the Catholic Church. Scripture scholars disagree if they are original to the Gospel or were added later. They are found in some of the oldest manuscripts but are curiously missing in many others. The verses are quite Lucan in theme. Jesus prays before his baptism and at the time of his transfiguration. At both of those moments, he hears a voice from heaven. 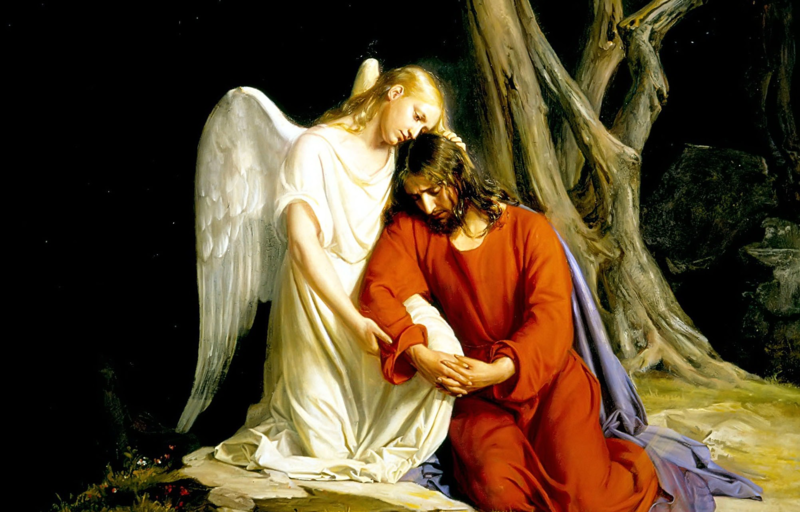 Here, again at prayer, an angel comforts him—in a Gospel where angels appear frequently. The Greek word agōnia means anguish, distress or struggle. The last is significant. It suggests that Jesus knows what the Father has asked of him, and he must strive within himself to accept his fate. In the garden, the voice of the Father has fallen silent, as if to give the Son his own space. The Father has made known his will. The Son struggles to accept it. Yet heaven remains close to Christ in the consolation of the angel. Christ could have escaped, but then there would be no escape for us. There is a rare medical condition, already attested to in the ancient world, in which sweat becomes tinged with blood. Without question, St. Luke wants us to know that the great agony of Christ has already begun. Before the soldiers arrive, before the physical attacks, in the silence of the night, the soul of Christ struggles in agony. In its way, the terrible foreboding of Christ exonerates all of his contemporaries, Jewish and Roman. The Gospels insist that Christ did not die as the victim of scheming villains. No, he sacrifices himself to save us from vile sins. As the evangelists see it, Christ could have escaped, but then there would be no escape for us. In St. Luke’s Passion, Jesus—somewhat wryly—tells his disciples that “two swords are enough.” Only one will be needed to enact the deeply human foible of striking a servant’s ear. Christ will emerge from his spiritual suffering without any act of self-defense. In silent agony, the last vestiges of a human will that might yet have resisted the divine will have been sweated out of him. When he stands, he is ready to be the sacred, sacrificial lamb who will suffer for the sins of the world. knowing that I shall not be put to shame (Is 50:6-7). A beginning of the agony christ is now posted here. All of you want to read it and this is the best diy paint project chance to read the whole story here. Must tell others about this story and make it famous as you can do. Thanks again Fr T for a great topic - one we should contemplate throughout the entire liturgical year. If we take all four Gospels and listen to Jesus in prayer, i.e., Jesus going 'out' to pray and Jesus praying with his friends, we can hear clearly the relationship of the Son to the Father with the Son open to constant revelation about Who He is and what His relationship is with the Father and the agony of death is that possible separation that being human contains within being of human-ness. I believe that Jesus agonized over that glimmer of separation because of the fullness that He experienced as an incarnate being within His relationship with the Father. Jesus truly lived the life of the Soul. God raped, by proxy, inseminated a virgin named Mary, in order to bring his son incarnate into our world. Mary and her fiancee?, Joseph, had to travel to Bethlehem to register for the census. There Mary gave birth to the Son of God. God put a star in the sky to guide people to the baby. As a man, God's son claimed that he was God incarnate: "I am the way, the truth and the life," he said. This man performed many miracles. He healed lots of sick people. He turned water into wine. These miracles prove that he is God? Miracles?? But he was eventually given the death sentence and killed by crucifixion. His body was placed in a tomb. But three days later, the tomb was empty. And the man, alive once again but still with his wounds (so anyone who doubted could see them and touch them), appeared to many people in many places. Then he ascended into heaven and now sits at the right hand of God the father almighty, never to be seen again. Today you can have a personal relationship with the Lord Jesus. You can pray to this man and he will answer your prayers. He will cure your diseases, rescue you from emergencies, help you make important business and family decisions, comfort you in times of worry and grief, etc. This man will also give you eternal life, and if you are good he has a place for you in heaven after you die. The reason we know all this is because, after the man died, four people named Matthew, Mark, Luke and John wrote accounts of the man's life. Their written attestations are proof of the veracity of this story. This, of course, is the story of Jesus. The agony in the garden and the Crucifixion and death remain a mystery. All of the redemption of humanity seems to have occurred in the moment,of conception at the Annunciation. Yet there is the period of public service during which Jesus explains and exemplifies the kingdom of God. So, why does his life have to end in Crucifixion.? The only explanation I can accept is that he was going the extra mile with all those who suffer. He accepted it to be in solidarity with all who suffer unto death, even though he understood that death is not the end. Isn't it the case that Luke does not portray Jesus in agony in Luke 22:39-46? Verses 43-44 are missing in the best manuscript witnesses. A later scribe added them because there was not enough agony in Luke's portrayal of Jesus on the Mount of Olives. Rather, Luke's Jesus is in control of his destiny, as Luke portrayed him as a self-sufficient Socratic figure, who does not cry out from the cross, "My God, My God, why have you forsaken me"? Luke's Jesus says "Father, forgive them for they known what they do," and "Into your hands I commend my spirit." Luke's Jesus is as innocent as Socrates, and so he does not fear death.